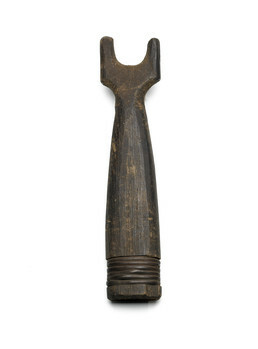 A wooden sheath with a seal-like “tail” encased the barbed tip of a seal harpoon when it was not in use. Legendary seal hunters from Gitadjū΄ became lost in fog and arrived at the undersea house of the Ocean People. There a supernatural being dressed in rings of woven cedar bark taught them spirit dances to perform during potlatch ceremonies. On the way back home the men capsized their canoe but managed to reach shore, and when one blew on his wet harpoon sheath it made a whistling sound like the voice of the dancing spirit. Haida celebrants used wooden whistles to re-create this sound and dressed in bark rings as their ancestors had been shown.